Comics have always been weird, but never more so than in the 90s when comic book companies were throwing the kitchen sink at the wall in order to keep comics relevant. Studios went as far as combining heroes, killing heroes, and creating alternate futures and timelines. This was done by both Marvel and DC, but Marvel was the biggest offender; with multiple series go more dystopian, in particular The Age of Apocalypse. But one future went across tons of different series, 2099. 2099 was presented as an alternative future for the Marvel universe, showing how things could change over 100 years. This was a much darker world than presented in comics set during the modern day. The world of 2099 is a cyberpunk dystopia, where North America is completely overrun by giant companies, the most notable being Alchemax. This is also a world mostly devoid of hope, because before the comics started, there were no superheroes. In fact, the superheroes of our age have more of a religious status, as shown by the Church of Thor. 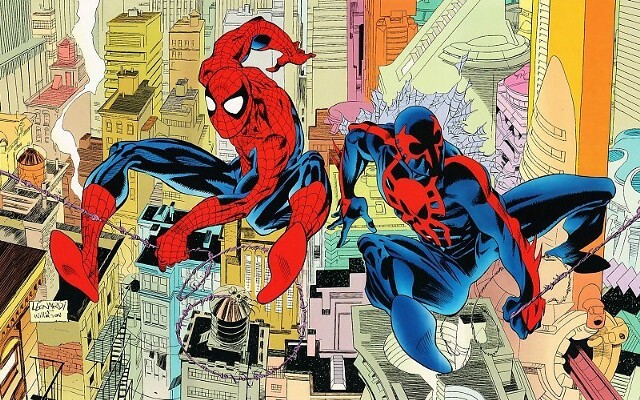 The 2099 comics were briefly popular, with the most popular series being that of Spider-Man 2099. However, as sales declined, more and more series were brought in to reinvigorate life. Some of these series became more popular than others, like X-Men 2099, but none of the series ever truly revived the 2099 branch. However by the end of its time, 2099 had tons of series, some of which even ended up connecting up with the main Marvel universe. There were chance meet ups between Spider-Man and Spider-Man 2099, or the fact that Doom 2099 was actually Victor Von Doom. There were also dozens of heroes, new, old, or a remake of an old hero. This is how we ended up with series like Hulk 2099, Ravager 2099, and Fantastic Four 2099. As interesting as these ideas sound, they weren’t implemented very well. It’s important to remember that these stories came out in the 90’s, so the stories weren’t great, and the art was a lot worse. These might have been trying to breathe some new life into stagnating comics, but looking at the more mechanical parts, they were functionally the same. Just a large gimmick to get some more sales. Many of the characters that were parts of these series were lost with the cancellation of many 2099 series, but that’s not necessarily the worst thing. The world of 2099 isn’t gone though, far from it actually. Whenever time/dimension travel is brought up, there’s almost always a visit to the 2099 world. Just look at X-Men Blue Vol. 3: Cross Time Capers. Obviously, this had the X-Men team travelling through time, in which they spent roughly an issue in the world of 2099, hanging out with the X-Men of 2099. This is a small example though, compared to the most well known character from the 2099 series, Spider-Man 2099. Spider-Man 2099 is by far the most popular character, and has remained relevant even to this day. He has appeared in TV shows, video games, modern comic series, and possibly even a movie with the upcoming Into the Spider-Verse. Spider-Man 2099 is one of the most iconic Spider-Men at this point, possibly even surpassing Ben Reilly’s stint as Spider-Man. Either way, at least one thing from the 2099 world will continue to be prevalent for years to come. So, when looking back on what 2099 was, it was very similar to other large spinoffs of the 90s such as Amalgam comics or DC’s Zero Hour, in that it was just trying to throw something at the wall to see if it would stick. However, the 2099 comics were, for the most part, very bad. Some ideas were interesting, and there was some real world commentary, but for the most part, it just was not good. But some people loved the 2099 series, not necessarily for what it was, but for the ideas it brought up. Either way, with the current Exiles series, and just its overall popularity, the 2099 world isn’t done with its time in the spotlight, and some of its characters certainly aren’t either.